Graduates of the Inglis Sydney Classic Sale have been enjoying a healthy run of success in Asia this month, with Turbo King adding his name to the list with an impressive Happy Valley win last night. Like last Saturday’s Group 2 Sandown Guineas winner Pressday, Turbo King is a first crop Classic graduate by emerging Darley stallion Domesday. He was secured for just $18,000 at the 2009 Classic Sale and is now the winner of two races in four starts. He stopped the clock in a slick 57.06 seconds for the 1000m and landed a plunge after firming from 5/2 to start a $2.10 chance. He joins a string of top performers for Classic on the Asian circuit in recent weeks. Last weekend, former New Zealand Group 1 winner Tell A Tale ($40,000 2007 Classic) ran second in the $S1.35million Singapore Gold Cup. Earlier in the month, Any Humour ($20,000 2005 Classic) was a Group 2 winner in Singapore of the TC EW Barker Trophy. 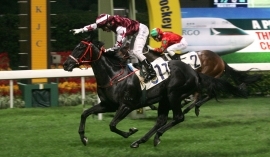 Also in Singapore, Ntini ($100,000 2006 Classic) won the Group 3 TC Paititi Gold Trophy in September. Of course, Classic was the sale where Hong Kong legend Silent Witness was secured from for just $55,000 in 2001. The 2011 Inglis Classic Sale will be held at Newmarket over three days from January 23 to 25. The catalogue will be posted online tomorrow.